Body Control . . .
Life is change. The human body is comprised of 80 to 100 trillion cells and each hour approximately one billion of these cells are replaced. That's 24-billion new cells per day! Talk about change! On a microscopic level, the human body is in a continual state of renewal. Change comes from the inside out. You'll keep getting what you've always got." An individual's state of health is reflected by lifestyle choices. From diet to posture, what we do or fail to do will affect our health. In general, humans are creatures of habit. The security associated with familiarity makes it easy to become a prisoner of the mind and resist change. Much research indicates that one is never too young or old to improve their life. The crux of Chapter Four, is to break out of self-imposed limitations and adopt a wellness philosophy and to act upon it! Think about all those cells constantly replacing themselves. Conceptually, one is not the person they were yesterday. With one billion neophyte cells created every hour, the only ingredient missing is acceptance by the mind. Change must come from within the mind. The changes necessary to decrease and/or eliminate back pain involve developing control of the mind and body. Ideally, the mind should be fully integrated with the body. For this to happen, an awareness of the body from the mind must be cultivated through a series of activities with a focus on coordination and postural awareness while increasing flexibility, strength, and endurance. "Whatever you can do or dream you can, begin it! For boldness has genius, power, and magic in it." Postural Awareness -- One of the quickest ways to decrease stress placed on the low back is by taking control of posture. 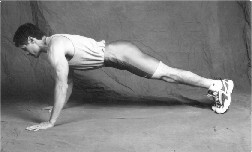 There are correct and not-so-correct ways to sit, stand, walk, bend, lift, and carry the body. Like a building with an uneven foundation, the framing, plumbing, electrical wires, and other internal structures will be affected. Poor posture can lead to the over-stretching and shortening of muscles and ligaments which can create excessive wear-and-tear on joints such as those in the lower back. In addition to muscular imbalance created by poor posture, the internal organs can be affected as abnormal pressures are placed on them. The center of gravity in the human body is located approximately at the crest of the hips, slightly behind the belly button (navel). Ideally, the head and torso should be carried over one another to minimize uneven stress. Continuous stress on the joints from poor alignment often times leads to pain. When the head is carried forward over the center of gravity, additional stress is placed on the structures of the back and neck. This can lead to soreness and pain. Because the muscles have to constantly pull hard against gravitational forces to keep the head and body upright, imbalances of the muscles, tendons, ligaments, joints, and other associated structures develop. These imbalances can also affect the mechanics of the spinal column and nervous system which can create additional health related concerns. This Self Test is quick and easy to perform. All that is required is a full length mirror and a well lighted room. Ideally, you should be in your underwear so all the physical landmarks used for comparison will be visible. 1. Stand in front of a full length mirror. Stand far enough back so the entire body is visible in the mirror from the top of the head down to the toes. 2. Close your eyes and take a couple of steps in place. Stop in a neutral position with the feet a few inches apart. Keeping the eyes closed, look down, then up. Be sure to perform these tasks slowly so you don't lose your balance. Return the head back to where you feel you are looking straight ahead and centered. If you experience any vertigo, dizziness, or have trouble with balance, do not perform this test. 3. Without moving from this position, open your eyes and begin comparing the visible land marks for symmetry. As in the illustration above, imagine a line through the middle of the body extending from the top of the head down to the ground. The nose, chin, sternum (breast bone), and the crotch should all fall to this mid-line. Additionally, the ears, shoulders and hips should be level. There are many other subtle postural changes to be aware of which you will find listed on the Postural Analysis Check List. Head Tilt - Look at the ears, if one is lower than the other, the head is probably leaning in that direction. Mark the side of the low ear. Head Rotation - Is one ear more visible than the other? If so, the head is probably rotated. The nose will deviate across the mid-line to the side opposite the more visible ear. Mark the rotation of the head according to the side of the nose deviation. Shoulder High - Is one shoulder higher that the other? If so, mark the elevated one. Hand Placement - Both hands should be equally visible. Does one fall farther forward than the other? If so, there is probably some rotational deviation to your posture. Mark which hand is farther back, that is the direction of rotation. Hip High - Look at the hips, is one higher? Is so, mark it down. Foot Flare - The feet should be symmetrically placed on the floor. Does one angle out more than the other? If so, mark it down. Generally, there will be a foot flare present with a rotational componet of the posture. If there are postural deviations present this may indicate an underlying structural imbalance. If pain accompanies these structural anomalies having a professional evaluation by a doctor of chiropractic, psychiatrist, or other qualified healthcare provider is in order. Activities of Daily Living -- The activities of daily living are the mundane tasks undertaken day-in and day-out such as showering, dressing, grooming, walking, sitting, sleeping, etc. Often times these common tasks are performed very inefficiently and can be a source of back pain. Subsequent chapters of this book will contain beneficial information to help you perform these tasks in a way which will minimize the risk of causing back pain. Breathing -- Blood circulates through the body driven by the beat of the heart. As blood passes through the tiny vessels in the lungs, it picks up oxygen which will nourish the body. The ancient Chinese and Native Americans both understood the importance of filling the lungs with air as related to health. Fully expanding the rib cage ensures an influx of air which will optimize oxygenation of the body. In future chapters there will be information on how to use various breathing techniques during exercise and to enhance overall well being.